A 0-60 time of 5.5 seconds, a top speed of 124 mph, maximum drive torque achieved in a quarter of a second. This is the 2019 Audi E-Tron, Audi’s first all-electric offering. The E-Tron is the first of three all-electric models Audi’s aiming to launch by 2020, and one of them is likely to be similar to the E-Tron GT shown back in March. And it comes at a key moment for the still fledgling EV industry. Mercedes, Jaguar, Chevrolet, Audi’s cousins at Porsche and more are all upping their electric game big time. And Tesla, which spurred the industry in part to consider the potential sales power of battery-powered cars, has struggled mightily as of late, and now a bevy of automakers and startups are rushing to get vehicles of their own into the public’s hands. The E-Tron SUV is another cast member to the growing field of luxury electric vehicles, especially crossovers. Audi’s framed it as a versatile ride—for sport, family, and leisure. The E-Tron can pack in five bodies and has 28.5 cubic feet of space in the trunk; 57 cu. ft. with the seats down. It’ll have some decent punch, too—a gallop to 60 mph in 5.5 seconds and a top speed of 124 miles. Audi didn’t shed light on power stats, saying the figures will become available closer to launch, but the E-Tron’s two asynchronous motor setup is supposed to achieve maximum torque in just 250 milliseconds, which is no surprise for an EV, but is still pretty damn fast. Audi also tried to solved the charging riddle, a key infrastructure question for automakers trying to wiggle their way into the EV space. The E-Tron is engineered for both AC and DC charging, and has a DC fast charging capability of up to 150 kW, which can deliver an 80 percent charge in just 30 minutes. Audi didn’t disclose U.S. range estimates, but said earlier it could achieve about 250 miles based on the new WLTP European standards. To that end, Audi tried to allay any concerns drivers may have about long-distance drives in the E-Tron. The SUV will be supported by the Dieselgate-funded Electrify America charging network. That’s the Volkswagen-created network of fast-charging sites, and if all goes according to plan, it’ll have nearly 500 fast-charging sites in place throughout 40 states and 17 metro areas by July 2019. Audi E-Troncustomers will receive a complimentary 1,000 kWh of charging at Electrify America sites with the purchase of the SUV. Audi didn’t want to go crazy with the design, and it’s completely obvious what it is upon first glance. It looks like an Audi. 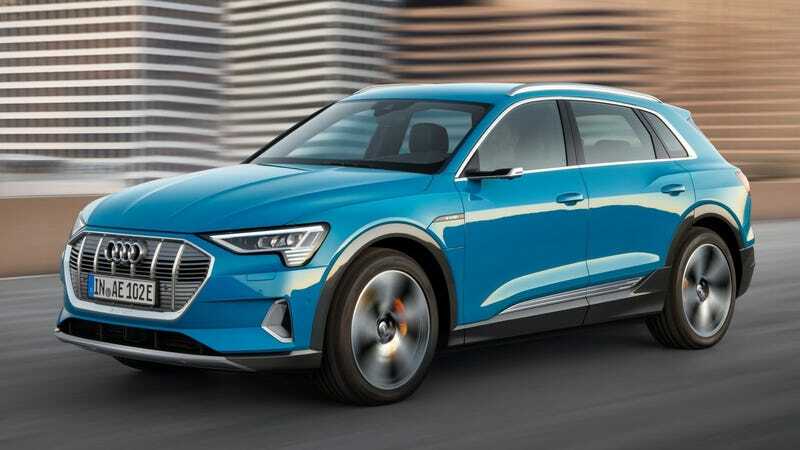 The E-Tron has an enclosed platinum gray grille that’s intended to mimic Audi’s AUVs, and Audi pointed out its continuous shoulder line that extends from the headlights to the rear. The E-Tron is being offered with three trims—Premium Plus, Prestige, and First Edition. Premium Plus is a funny way of saying “base” model, and it starts at $74,800, with 20" all-season tires, panoramic sunroof, 12 way power front seats that can be heated or cooled, and Audi side-assist with cross-traffic alert technology. For $7,000 more, Audi’s offering the Prestige trim, which tacks on a Heads-Up Display, driver assistance tech package, and individual contour seats with a massage function. To mark the occasion, Audi’s also releasing a limited First Edition trim, with 999 units being offered in the U.S. market. At $86,700, that’ll include a Daytona Gray color exterior, 21-inch bi-color black wheels, orange brake calipers to match the headlights and highlights surrounding the nameplate located near the charge port. Deliveries are expected to begin in the second quarter of 2019. Overall, it’s easily one of the most “normal”-looking EVs to date, eschewing the spaceship looks of the Model X or even the Jaguar I-Pace. But it’s nice, it’s premium and should be an interesting competitor in this growing space.